Q: What do kids do at a Mad Science birthday party? A: During the first 45-50 minutes, the Mad Scientist will engage the children with amazing science demonstrations that are conducted with the help of your birthday child and guests. 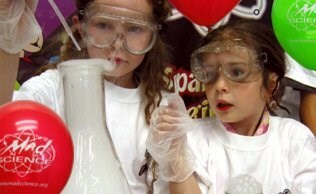 The children will participate in totally cool science experiments as they discover the spectacular world of Science. During the final 10-15 minutes of the party, the kids will make ooey gooey slime. Adding on a Rocket Launch, Cotton Candy, or Bubbling Potions (Dry Ice show) Finale will add 10-15 minutes to the length of your basic party. Q: How far in advance do I need to book my party? A: Our party schedule fills up quickly. We suggest you book well in advance to get the date and time you want. Generally, at least 3 weeks in advance is recommended. Q: What do I need to do to make a reservation? A: You can fill out an online request form by clicking on the “Book now” button. We will respond to your request one business day. You can also call us at (425) 556-0800 and we’ll be happy to schedule your party over the phone. We require a $50 deposit to book your party and accept Visa, MasterCard, and Discover. Your deposit is fully refundable up to 3 business days before your party. Q: What time can I have my party? A: On Saturdays and Sundays we have set party times of 11:00 a.m., 1:30 p.m., and 4:00 p.m.. Parties can also be scheduled Monday-Friday at any time. All dates and times are subject to availability. Q: Do I need to know the exact number of kids attending my party to book it? A: No. All we need is an estimate of the number of children you expect to attend. We ask that you plan for the largest number of children expected. On the day of the party, you will be charged only for the number of kids that actually attend with the exception of parties with 30 or more children, where you will be charged the original amount. Q: Do you have any themed parties? A: All our themes revolve around science. If you have another party theme, we can notify the Mad Scientist, and he/she will do his/her best to incorporate your theme into the experiments and language that is used. Q: When will the Mad Scientist arrive? A: The Mad Scientist will arrive at least 15 minutes in advance of your party time to set up. He/she will be ready to start the show at the time you booked. It is best to start your party at least 30 minutes before your Mad Science show is scheduled to start, to ensure the Mad Scientist is able to start on time. Q: What kind of space is needed? A: The Mad Scientist will need at least a 4 ft. sq. table. We ask that you have enough space for the Mad Scientist to work and for your guests to be comfortable. The kids can be seated on the floor or on chairs, several feet back from the table. Q: How much space is needed for the rocket launch? A: The Mad Scientist will need a medium to large sized back yard or open space to launch the rocket. If you are not sure whether you have sufficient space, you can always add the rocket launch and then the Mad Scientist will assess whether or not it is safe to launch the rocket on the day of the party. You will not be charged for the upgrade if the rocket cannot be launched safely. We cannot launch a rocket from a public venue without express written permission. Q: Will I have to provide the Mad Scientist with anything? A: We will need access to water for set-up and clean-up and access to electricity. Please let us know if your party location cannot have either of these. Q: Once I have scheduled my party, can I make changes to it later? A: Any changes to your party must be scheduled by Wednesday before your party. Q: Is it okay to have other activities going on while the Mad Scientist is performing? A: The Mad Scientist will begin at the scheduled start time and continue until our portion of the entertainment is finished. We will not be able to stop for any other activities (ex. food or cake). Please plan accordingly. Q: If it's a nice day, can I move my party outside? A: No, for the best possible party we can deliver, your party will have to be inside. Q: Are all of the finales available year round? A: During the winter months we cannot offer a rocket launch for a 4p.m. party. Q: For what ages are your parties appropriate? A: Our parties are appropriate for children between 5 to 12 years of age. 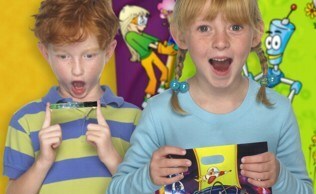 Younger siblings generally watch, but do not actively participate in the party as a volunteer, nor do they make slime. We determine the number of attendees based on the number of children actually participating. A: We require a $50 deposit to book your party. At the end of your party, you will pay the Mad Scientist the remaining balance, plus for the amount of goody bags you purchase. You can pay with cash, check, or provide authorization to charge the credit card we have on file. Q: What is your policy on tipping? A. If you think your Mad Scientist did a great job, a tip is very much appreciated. If you have any other questions, please call us at (425) 556-0800.